15-20 years ago the most common objections heard to the idea that better infrastructure was required to enable mass cycling came from people who promoted training of cyclists and vehicular cycling. It was claimed that if enough people could be trained to cycle amongst motor vehicles then no cycling infrastructure was required. Decades have passed and of course no such result was ever seen because the problems which faced people cycling had not been resolved. 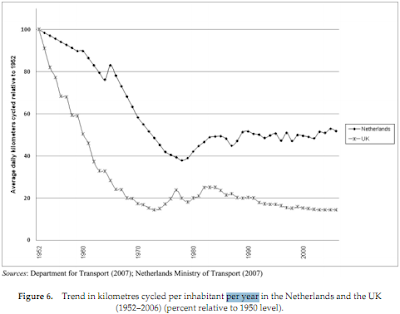 Meanwhile, those places which built better cycling infrastructure have seen improvements in cycling modal share. The calls for training and vehicular cycling have become much quieter in recent years, but similar calls are now being made for another related idea: That take-up of e-bikes will result in mass cycling despite conditions on the roads not having been improved. This idea has no more validity than the claims made 20 years ago. If you take someone who is scared to cycle because of the danger of traffic and give them a bicycle they are unlikely to take up cycling just because they now have a bicycle. I pointed out years ago that "a shortage of bicycles was never the reason for the low cycling rate of London" but this applies worldwide. Millions of bicycles gather dust in sheds around the world because their owners don't find riding them on the local streets to be appealing at all. If you take someone who is scared to cycle because of the danger of traffic and give them a bicycle with a motor, the reaction is very likely to be the same. The source of the fear has not been addressed by adding a motor to the bicycle so they'll still be unlikely to take up cycling. Parents who are not happy to see their young children ride bicycles on roads filled with motor traffic will be no more enthusiastic about them doing the same thing with a motor on their bike. Pensioners who are currently scared to cycle on busy roads won't suddenly gain enthusiasm because someone has given them a motorised bicycle. People with disabilities who use hand cycles or other mobility devices but can't travel far with them because they do not feel safe on the streets are not suddenly going to feel safe to put themselves in front of motor vehicles because they have been given a motor. Proponents of e-bikes often point to studies which often don't say what they think they say. There's a Danish study which is sometimes claimed to show an "11% increase" in cycling due to e-bikes but of course the reality isn't quite like that headline. The study involved 120 people from a city of 61000 who volunteered to be part of a study about the potential of e-bikes. 80 took part in the after study analysis. Of those, 45% claimed they cycled more after they were provided with an e-bike (55% said they cycled the same or less). The 11% increase in cycling which was observed was within the 80 people who chose to take part because they were already interested in e-bikes. That some people who thought they wanted an e-bike turned out really to want an e-bike should surprise no-one. What's more, it's important to note that because these people lived in Denmark they were already in a country which has relatively developed cycling infrastructure and a relatively high cycling modal share because of that infrastructure. They have somewhere safe to ride their e-bikes. This is not a result which has any relevance to a country which does not have cycling infrastructure. Note that while some website headlines are dramatic they're quite loosely connected with the report itself which uses more reasonable language. I suggest that it's important to read the report itself to understand what the survey was and what the results mean. Methodology affects results. The authors are candid and honest about the scope of their survey. They do not claim that it is impartial and nor do they claim that the results can be extrapolated to the population at large. This survey was supported by e-bike manufacturers financially as well as with "input, feedback and efforts on the project to make sure it was successful." The people surveyed were all people who already own e-bikes and over 80% of respondents had owned their e-bike for less than two years when they responded to the survey. We can therefore expect new owners' delight with their new purchase to be reflected in the results. This survey of 1800 people targeted a self-selected group of people who were found "through e-bike blogs and forums, multiple social media platforms, manufacturer and retailers’ e-mailing lists, and cards left on e-bikes throughout the Portland, OR, area" and as such we can expect many enthusiasts amongst the respondents. The authors don't try to deceive but acknowledge the limitations of their survey. They admit that respondents were not selected randomly and that findings might not be representative even of the whole population of e-bike owners, let alone the population at large. None of this is a criticism. The report authors are quite clear about what they've done and by presenting their data as they have, they have given an insight into North American e-bike owners. I do, however, criticise some of the websites which have published dramatic headlines based on the survey and some of the people who have taken those headlines and made yet more dramatic claims because the results of this survey have been taken out of context. It should be noted that most of the e-bikes used by respondents to this survey are too powerful to be recognised as e-bikes in most countries. Only 6% of respondents have e-bikes on which assistance is available only up to the 25 km/h which applies for an assisted bicycle in the EU. 94% of respondents have e-bikes which are more powerful than that. i.e. most of these e-bikes would be classified as "speed pedelecs" in Europe - number plates are required and riders must wear helmets. While only 6% of respondents have the slower EU legal e-bikes, a greater number (7%) have bikes on which the motors are so powerful and can push their riders at such speeds that in Europe they couldn't even be speed pedelecs, but would have to be registered as motorbikes. As such, this study's application to many countries is already limited as it mostly concerns itself mostly with a completely different class of vehicle to that which we would recognise as a legal assisted e-bike in Europe. The limitations of self-reporting are also exposed. While more than half of respondents claim to be of "very good or excellent health", only a quarter of respondents say that they do even 30 minutes of moderate exercise per day, as recommended widely as a minimum required for good health. 3/4 of e-bike owners do not take 30 minutes of even moderate exercise a day and therefore also cannot be cycling for 30 minutes a day. The most common maximum speed of assistance is 20 mph, suggesting that the distance covered even by most of the respondents who actually do take 30 minutes of exercise per day will be somewhat less than 10 miles (16 km) while most respondents will cover somewhat less distance than this. This puts the report's claim of an "impressive decrease in vehicle miles traveled" in some doubt. had an e-bike ? Choose from one of these answers. Though the most common reason why people do not cycle is the fear of motor traffic, the multiple choice question which asked about why people didn't cycle before they got an e-bike did not include that as a response. Instead, people were led to give other responses such as that distances were too long for cycling, that hills made cycling difficult or that it was difficult to carry things on a bike. Some respondents specified "other" and then wrote this themselves but it is very likely that this most important reason for not cycling was under-reported due to the design of this question. The study goes some way to address this by including the following passage, but because it's not an answer to a question it doesn't appear in the hastily written summaries which have appeared on websites elsewhere: "Throughout open-ended responses, e-bike users often expressed insufficient bicycle infrastructure as a significant barrier to riding more (for both standard bicycles and e-bikes), as one participant states, “I don't always have safe infrastructure to get where I need to go. [If that is the case] Then I drive” (anonymous respondent). Some of these barriers to riding a standard bicycle cannot be solved by switching to an e-bike;"
At least one respondent uses their e-bike to address a social safety issue: “I ride through several homeless camps on my eighteen mile trip. My e-bike gives me a sense of security knowing that I will have the energy/power to get out of the area if I feel threatened or fear for my safety.” This should have been addressed through a combination of a more humane social policy which addressed the issue of homelessness combined with better town planning. Another says that an e-bike allows overcoming a different problem due to poor town planning: “I live in the suburbs now, so the same errands are much longer distances. An e-bike makes it possible for me to continue to use a bike instead of a car.” Local errands ought to be over local distances. 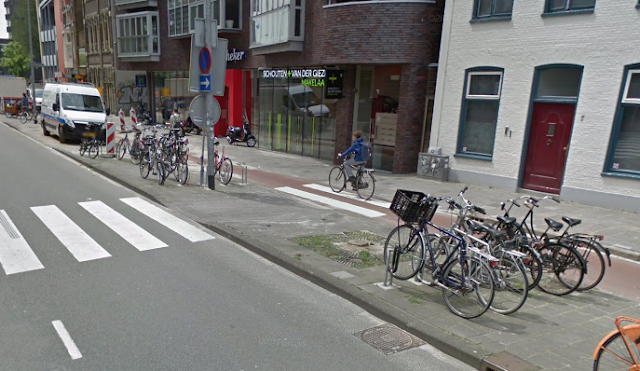 Dutch suburbs are designed to include facilities and encourage cycling. Some report using their e-bikes to take longer routes than they would otherwise because by doing so the rider can experience less vehicular traffic. i.e. they're compensating for the lack of good cycling infrastructure where they live. 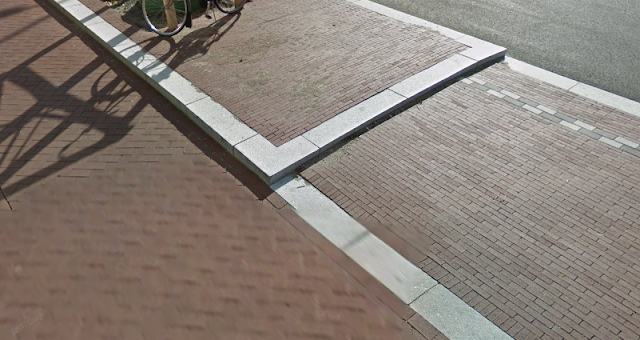 Cycling infrastructure should always enable taking the shortest possible route in safety. Some respondents claim that being able to ride at high speed enhances safety alongside faster vehicles, again compensating for poor infrastructure. Being able to ride as part of the motor traffic is aligned closely with the failed vehicular cycling ideas (it's a strategy for surviving a hostile environment but not a way to create mass cycling). This claim is similar to a popular claim made by drivers of cars that being able to break the speed limit results in better safety, but there is little evidence to support that. Higher speeds are almost always linked to more danger, regardless of the vehicle so I am skeptical that this would work differently for e-bikes. Note that the Dutch experience is the reverse. Pensioners have taken up 25 km/h assisted cycles in quite large numbers to allow them to continue a lifetime of everyday cycling using the extensive country-wide grid of safe cycling infrastructure which they already used on a normal bike. Despite the safety of the infrastructure design and their relatively small increase in speed to a maximum of 25 km/h, the extra speed, weight and slight unpredictability of assisted bicycles has resulted in a surprisingly large increase of injuries and fatalities to older people due to a rise in single rider collisions. Unsurprisingly, most of the respondents report conflict with motor vehicles. This is a problem for anyone riding a two wheeler in traffic, powered or not). Motorcyclists were using the term SMIDSY (Sorry Mate I Didn't See You) to refer to the incidents in which drivers claimed not to have seen a motorcycle some years before cyclists picked it up. Let's remember that the e-bikes in this US survey are much faster than those which are legal elsewhere. There's nothing new about making ever faster powered bicycles. People have found ways to put engines and motors onto bicycles thereby transforming them into mopeds and motorcycles for more than a century. People who required something like a bicycle but with a motor attached have been able to legally buy and use those vehicles for more than a century. Modern e-bikes which assist up to 25 km/h are a new and special case in that their speed has purposefully been made compatible with normal cyclists going about their everyday business and in that the assistance is always relative to force on the pedals. In the Netherlands, slightly faster mopeds are much less popular than bicycles (powered or not) and are commonly considered to be a nuisance to cyclists. What has been seen in Europe is that people who in the past might have bought a moped are now likely to consider buying speed-pedelecs with speeds up to 45 km/h (comparable with the majority of the US e-bikes) which are classified in a similar way to mopeds, requiring a number plate and a helmet on the rider. A combination of these types of bikes and straight electrically powered mopeds without are replacing mopeds with petrol engines. Because they don't have the same noxious emissions, most people see this as an improvement. The faster "e-bikes" in the USA are not e-bikes here. That's not pejorative and it's not just an opinion. The law in the EU and this country places limits on assisted bicycles and such high powered machines can't be e-bikes. As a result most of the bikes in the US study would need to be registered and have a number place in Europe, the rider would have to wear a helmet and they cannot be ridden everywhere that a normal bicycle (or 25 km/h e-bike) can be ridden. In the Netherlands, mopeds are used to make about 1% of journeys and their riders suffer from much the same prejudice as do riders of bicycles in countries where cyclists are the 1%. However I have nothing against speed pedelecs, mopeds or motorbikes. To me they're just other alternative means of transport, all of which leap with remarkable ease over the very low bar of being "better than a car", so while I don't choose to ride any of these things myself, I'm not opposed to them. What's more, I live in a city whose main claim to fame is hosting motorcycle races. This would not have been an attractive location to move to if I particularly disliked motorized bicycles of any type. E-bikes, 3D printers, metal detectors, smart watches ? The US survey was carried out in 2017. Over 80% of the respondents reporting buying their e-bike in 2015 or later. i.e. most were recent converts to e-biking. Over 95% report being very satisfied or satisfied with what is for many a new purchase. Any survey which asks people who recently bought any gadget whether or not they like that gadget and whether or not they use it is likely to report that the people who recently bought a gadget do like it and do use it. It really doesn't matter what the gadget is. You could run the same survey with accessories for normal bikes, parts thought to enhance performance of normal bikes (e.g. lighter wheels), or even totally different products such as 3D printers or smart watches. This does not invalidate any of those devices, which some people make good use of, and it also does not make the e-bike less valid either. We should recognise that new owners of pretty much any product tend to be enthusiastic about their new purchase. Regardless of what kind of bike they have bought, people will always report using a new bicycle more than their old bicycle. Because most of the respondents are new purchasers we have to expect that to some extent respondents self-reported opinions will express this aspect of human nature. What is the effect on modal share ? Any claim of a huge shift in how people get around based on this survey has to be grounded in the actual mode share figures. The survey was carried out in the USA and Canada. Unfortunately, both of those countries have staggeringly low cycling modal shares, amongst the lowest in the world. Before modern e-bikes became popular, fewer than 1% of trips were made by bike in the USA and Canada. After e-bikes became popular this remained under 1%. Despite their very high population densities resulting in short average trip lengths in comparison with Dutch cities, American cities such as Los Angeles and New York have almost unbelievably low rates of cycling. If you're interested in cycling, there is nothing that the rest of the world really can learn from those places except what not to do. In the USA, 40% of all trips are under 2 miles in length but 90% of those short trips are made by car. There's a huge potential win there taking only the shortest distance into account. took over the roads. Modern Dutch town bikes are the same. E-bikes are simply not required to enable the short journeys which make up the majority in any nation to be made by bicycle. No kind of special bike is required over these distances Even the most basic type of everyday bicycle can cover the majority of most peoples' short trips. The distances are so short that they can be covered by almost anyone at all in almost no time at all, riding any bicycle and without breaking a sweat. But that is not what happens in North America. Why ? There's no safe space for cycling so cycling even over short distances is neither pleasant nor safe, on any bicycle. If you can't convince the population to use a bicycle to ride a significant proportion of low single digit distances then it's not going to be possible to convince them to do so over longer distance either. What can we make of the survey overall ? The USA is a particularly hostile country in which to cycle and peoples' motivations for using an e-bike included social and planning issues which hopefully do not apply elsewhere. The survey was not designed to be representative of either the population as a whole or even of e-bike owners. Survey respondents were largely e-bike enthusiasts who selected themselves. Leading questions in the survey resulted in answers which may not accurately reflect the views even of those who took the survey. Any survey of people who have just bought any new product will tend to be positive (see 90% of online reviews of anything). The definition of an e-bike is so broad that most respondents are using types of motorized vehicles which are legally in a different class in other countries. The claims of large shifts are confined to the self-reported actions of the self-selected few who took the survey. They are not represented in the modal share figures of the countries in which the survey was based. In short: Surveys of this form can mislead the reader into thinking there has been a transformation in cycling which in reality does not exist. I will note again that the authors of the report are quite open about their methodology so I can't criticise them for this. But because of the points above, this report says very little, if anything at all, which can be translated to any other place and certainly nothing which will assist with increasing cycling modal shares in other nations. 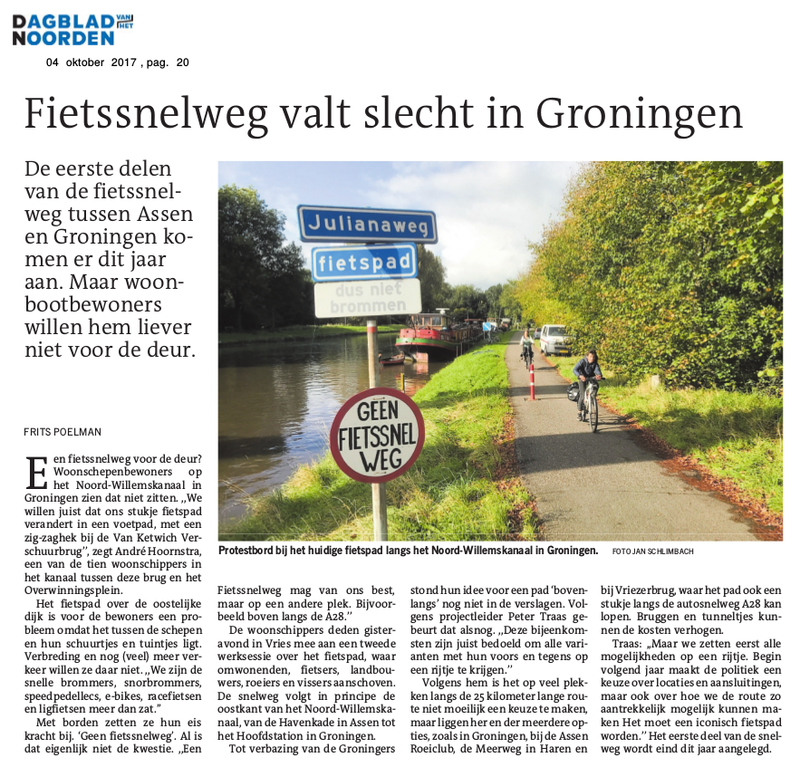 So how can we encourage vastly more cycling ? The logical way to increase cycling is to look to where there has been real success and copy what led to that success. It makes little sense to try to emulate even the boldest claims made in a country where less than 1% of journeys are made by bike when there is a far better example to look at. In cycling, one country leads the rest of the world by a large margin and the Netherlands is that country. Forty years ago, city scale experiments were performed in Dutch cities to find out what was required to create a genuine and long lasting increase in attractiveness of cycling and therefore a genuine and long lasting increase in cycling. The result was really not surprising - the successful experiment consisted of building a comprehensive grid of infrastructure which connected every home to every destination in the city. This enabled everyone to cycle and resulted in an increase in cycling across all demographics. The same thing was copied across the entire country of the Netherlands and while the efforts are not uniform and nor is the result, the entire country now has a high cycling modal share compared with any other country. All that other countries need to do is copy the successful experiment, choosing from the most successful Dutch schemes. Once people are enabled to cycle, they will be able to choose a bicycle which suits them. Some will opt for assisted bicycles, some will opt for speed pedelecs, some will choose a normal human powered bicycle. That's all good. But no-one should be forced to believe they need to choose what is effectively a motorbike in order to keep up with other motor vehicles. A few minutes after publishing this blog post, the video below came to my attention. 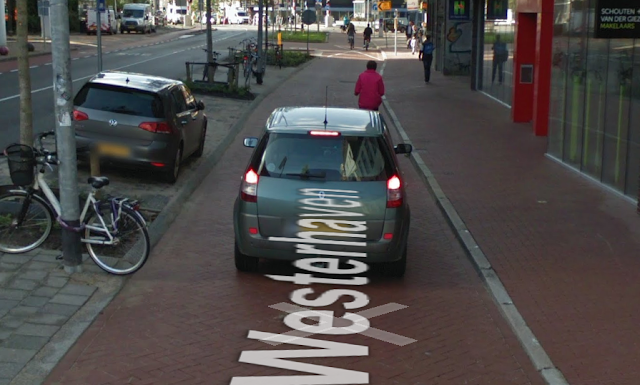 It shows an older person with a mobility scooter accidentally riding through the door of a bakery in the centre of Assen yesterday. Many older people who can no longer cycle use mobility scooters to get around in this city. They make use of the many cycle-paths which provide direct and safe routes to the city centre from suburban areas. This incident occurred in a nearly car free street at the edge of an area where no cars are allowed. If this person had made the same mistake in a different place with a lot of motor traffic, or in this exact location 40 years ago, then accidentally riding out into the middle of a busy junction could have been catastrophic. I've added this video because it illustrates part of what I wrote above about vulnerable people. Once we reach an age where controls on something as simple as a mobility scooter become confusing enough that accidents like this can happen, the last thing that is required is more speed so that decisions have to be made more quickly and more frequently. While it is a mobility scooter and not a bicycle in this video, mobility scooters are amongst the many types of vehicle commonly used on Dutch cycle-paths alongside bicycles and there is a relationship between this incident and how pensioners in the Netherlands have more frequent crashes when riding electrically assisted bicycles. A safer built environment cannot prevent mistakes, but it always helps everyone to be safe even if they make a mistake. Road works always risk placing cyclists at a dangerous disadvantage, which can result in people opting for another form of transport. To prevent this, cycle-routes must always be maintained, as can be seen in this video. There are many other examples of this principle being applied in many different situations.